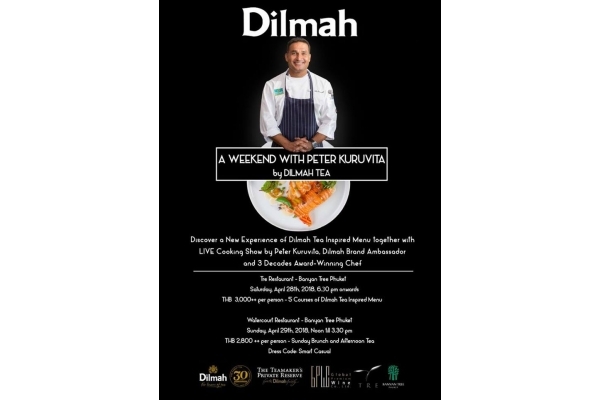 Global Premium Wine Co.,Ltd, the sole importer and distributor of Dilmah tea, the finest Ceylon tea in the world from SriLanka, and Banyan Tree Phuket will hold “A Weekend with Peter Kuruvita by Dilmah Tea” to celebrate 30 years of Dilmah. The Australia’s internationally renowned chef Peter Kuruvita will compose an exclusive Dilmah Tea inspired symphony of courses with an exciting live cooking show for two days only from April 28th – 29th at Banyan Tree Phuket. Chef Peter Kuruvita is a multi-award Sri Lankan-Australian celebrity chef and brilliant restaurateur, with an illustrious career spanning over 3 decades. While his cooking inspiration has come from his talented mother, Chef Kuruvita has always been a firm follower of Dilmah tea since a young age while growing up surrounded by Western cuisine in Australia. Chef Peter has now diversified his career to encompass the roles of TV presenter, author, industry speaker, restaurant consultant, and as a Dilmah Tea Ambassador. For his first ever visit to Thailand, Peter will use Dilmah tea, the best Ceylon tea in the world from Sri Lanka, as a unique ingredient to create a true taste of East meets West fusion cuisine. As part of a bespoke 5-course dinner menu, the event will kick off with a fresh Tuna Salad with smoky Dilmah Lapsang Souchong, followed by a crispy Lamb Bacon glazed with Ceylon Cinnamon Spice Tea reduction. Guests will indulge in the delectable Dilmah Earl Grey Brown Butter glazed Chicken as well as the Grilled Organic Phuket Lobster accompanied with Dilmah Vanilla Tea and Pineapple Upside Down Cake. The finale: a light Dilmah Spiced Chai Shortbread with refreshing Ceylon Chai Sorbet. The dinner on April 28th is priced at 3,000 Baht net per person inclusive of Dilmah Tea pairing. Sunday Seafood Brunch featured with Dilmah Afternoon Tea on April 29th is priced at 2,800 Baht net per person.